Could A Lea Valley Metro Be Created? Crossrail 2 envisages these developments and level of service North along the Lea Valley. A four-track West Anglia Main Line between Tottenham Hale and Broxbourne stations. A service running between Tottenham Hale and Broxbourne stations. Crossrail 2 also envisages that at Tottenham Hale station, the line will enter a tunnel for Central and South West London. But there is an unused alternative terminal, that could handle perhaps 16 tph with modern signalling. Look at this map from carto.metro.free.fr of the lines at Stratford. 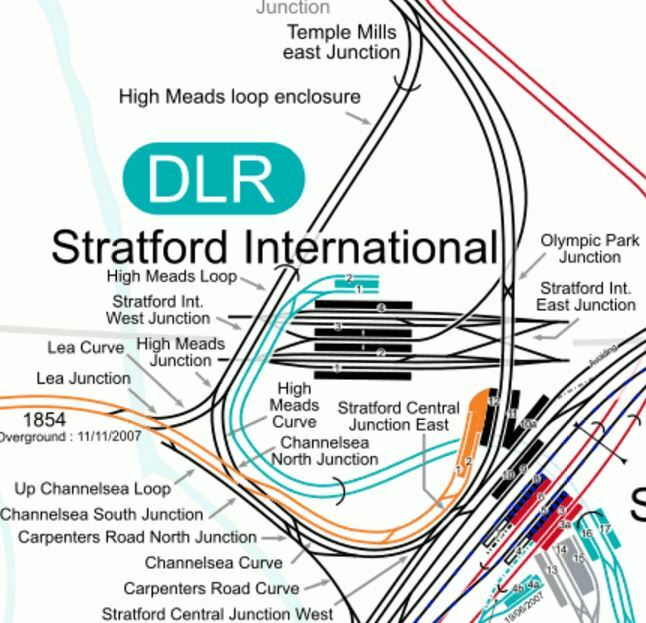 Note the double-track loop that encircles Stratford International station and goes through Platforms 11 and 12 at Stratford station. Loops like this can easily handle 12 tph, as they do in Liverpool with the Wirral Line. Stratford is well-connected to the Central, Great Eastern Main, Jubilee and North London Lines, Crossrail and the Docklands Light Railway. The Loop could be connected to Stratford International station for Southeastern Highspeed services. There’s probably enough capacity to allow a couple of Stansted services to terminate in the loop. There is a massive development going on at Meridian Water, where a new station is being built. Liverpool Street station lacks capacity. I can’t believe that a viable 12 tph service is not possible. The major works would be as follows. Four-tracking the West Anglia Main Line into two fast and two slow lines. Creating a flyover at Coppermill Junction to connect the fast lines to Liverpool Street and prepare for Crossrail 2. If Crossrail 2 is built in the future, the Metro service would be diverted into the central tunnel at Tottenham Hale station. The Chingford, Cheshunt and Enfield Town services of the London Overground will not only offer alternative routes during the four-tracking of the West Anglia Main Line, but they could be better connected to a Lea Valley Metro. Tne Class 710 trains could enable four tph on each branch. The Class 710 trains will enable faster services on each branch. A reinstated Hall Farm Curve would connect Chingford and Walthamstow to Stratford. Creation of a step-free Cheshunt station would ease transfer between the London Overground and the Lea Valley Metro. The new trains will be key and may open up more possibilities. Note too, that moving services to Stratford from Liverpool Street will release capacity at Liverpool Street, that will be well-used by Greater Anglia and London Overground. She’s always there when you need her and engineers keep coming up with ways to keep the Victoria Line giving more. Currently, the frequency of trains between Walthamstow Central and Brixton is 36 tph. I can’t believe that the engineers working on the line, don’t want to squeeze another four tph out of her, to achieve the fabulous forty. This might be possible with the trains, tracks and signalling, but the problem is the capacity of some of the 1960s-built stations. Many stations have an empty space, where a third escalator could be. Lifts are few and far between. Some stations don’t have ceilings in the platform tunnels. These stations could be improved. Walthamstow Central station gets desperate in the Peak, but it could be given a third escalator, a second entrance at the other end of the platforms and a much better step-free connection to the Chingford Branch of the Overground. Blackhorse Road station could be finished and given a third escalator to cope with the extra passengers that will transfer to and from an electrified Gospel Oak to Barking Line. Tottenham Hale station is being rebuilt to increase capacity. Will it get the missing third escalator and ceilings? Seven Sisters station will be a Crossrail 2 station and will need updating to cope with an expected eight tph on the Overground. Expect a major project here. Finsbury Park station is one of London’s stations designed by Topsy. Improvements are underway to cope with the extra passengers from Thameslink and an upgraded Northern City Line. Highbury and Islington station suffered worst at the hands of the Nazis and 1960s cost cutting, when the Victoria Line was built. This made it one of London’s worst stations. However help is at hand. Plans are being prepared for a second entrance to the station on the other side of the Holloway Road. The frequency on the Northern City Line is being upgraded to twelve tph with new larger capacity Class 717 trains. There is space for a third escalator to be added to connect the Overgriound with the deep-level Victoria and Northern City Lines. It should be born in mind, that Highbury and Islington station is busier than either Manchester Piccadilly or Edinburgh Waverley stations. But with an upgrade, because it has cross-platform interchange between the Victoria and Northern City Lines, it could be an upgrade that increases the passenger capacity of the Victoria Line. Euston station will be upgrqaded for HS2. Oxford Circus station is desperately in need of more capacity, especially as there will be an upgrade to the Bakerloo Line in the future. The opportunity at Oxford Circus is that some of the buildings around the junction are tired and some probably need to be replaced. So will we see a development like Bloomberg Place, that will create a new entrance to Bank station, at Oxford Circus? Could it also have an subterranean connection to Crossrail’s Hanover Square entrance for Bond Street station? Victoria station is in the process of being upgraded. It certainly appears to be a case of so far so good! Vauxhall and Brixton stations have rather undeveloped interchanges with the National Rail lines and these could surely be improved. Under Possible Future Projects in the Wikipedia entry for the Victoria Line, this is said. For many years there have been proposals to extend the line one stop southwards from Brixton to Herne Hill. Herne Hill station would be on a large reversing loop with one platform. This would remove a critical capacity restriction by eliminating the need for trains to reverse at Brixton. The Mayor of London’s 2020 Vision, published in 2013, proposed extending the Victoria line “out beyond Brixton” by 2030. This would surely be the last upgrade to squeeze even more out of Dear Old Vicky. A Lea Valley Metro can be created and eventually, it can be the Northern leg of Crossrail 2. Before Crossrail 2 is completed, it will have great help in the following ways. In North East London from the London Overground. Across London from the Victoria Line. Don’t underestimate how Crossrail and an updated Northern City Line will contribute. Re-instatement of Hall Farm curve would be nice. I agree with that totally! As does my son, who lives in Walthamstow. Extending the ELL to the end of the viaduct at Camden Road through Caledonian Rd and a reopened Maiden Lane would help spread the load. The NLL would be diverted to the disused northern pair before it is grabbed for a Hi-line parkway. The HS2 budget should pay for it to remove the Hampstead overground from Euston.